I am pain free for the first time since having my thyroid removed March 2004. Shortly after that surgery, I developed a pain on the right side of my abdomen. After having some tests run, they couldn’t determine what the cause of the pain was and decided to watch it for a while. Two months later, I thought I had a case of food poisoning. After several rounds of antibiotics, it was not clearing up. Meanwhile my entire abdomen felt like it was on fire with intermittent sharp pains running through it. I spent much of the year on the floor, doubled over in pain. Visits with a couple of gastroenterologists, numerous diagnostic tests, and it looked like no hope of a diagnosis. In the beginning of 2005, the pain changed and became more indicative of gallbladder problems. An ultrasound showed that I had polyps. After the second major attack that dropped me to my knees, I had my gallbladder removed. Unfortunately, the sharp, burning pain in my abdomen returned once I was off the painkillers from surgery. More tests were run. I spent more time off work and more time on the floor. I was very nauseated. By this point I had lost about 40 pounds and had no energy. My sister recommended that I try acupuncture. She lives in Colorado and her husband’s partner was treating her with acupuncture for symptoms of menopause. I also remembered that my mom had finally found relief from a back injury through acupuncture. I went to a student clinic to try it. The first treatment eliminated the nausea. I continued to go to the clinic sporadically. After another trip to the Emergency department in August, a gastroenterologist diagnosed me with colitis and prescribed some medication. Even with the medication, my symptoms continued. By this point I knew that the acupuncture was helping so I decided to pursue it on a more consistent basis than the student clinic afforded. Now I needed to find a licensed acupuncturist. I read an article in Business First about New Realm Acupuncture Center. 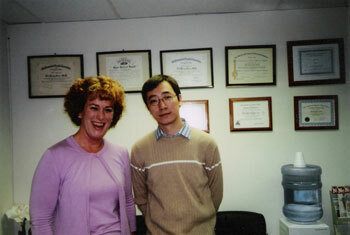 They had an impressive resume, with a family history of practicing Chinese medicine. After six visits, I was almost pain free and for the first time in over a year am beginning to feel like myself again. I have more energy and feel like I am finally getting my life back. People ask me if the treatment hurts. The treatments have never been painful. It barely feels like a pin prick. They also talk about the expense. I do not know what I have spent this past year in co-pays to physicians, time away from work, or what the total outlay has been from my health plan. I do know the acupuncture treatment has not cost any where near my last emergency department visit (approximately $4,000). I cannot even begin to express my thanks for the help of GAO & Jing.